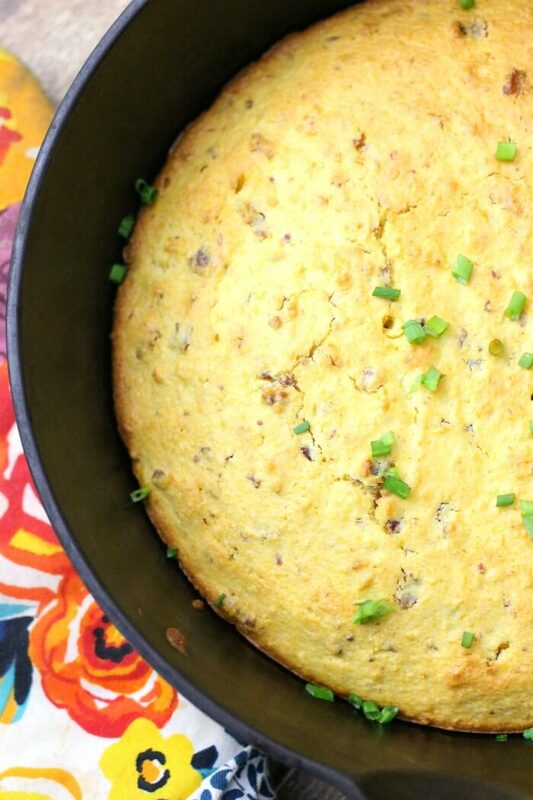 Our Cornbread Recipe made with bacon is the perfect addition to your next chili meal. Only a few ingredients to get dense, moist, never dry cornbread! 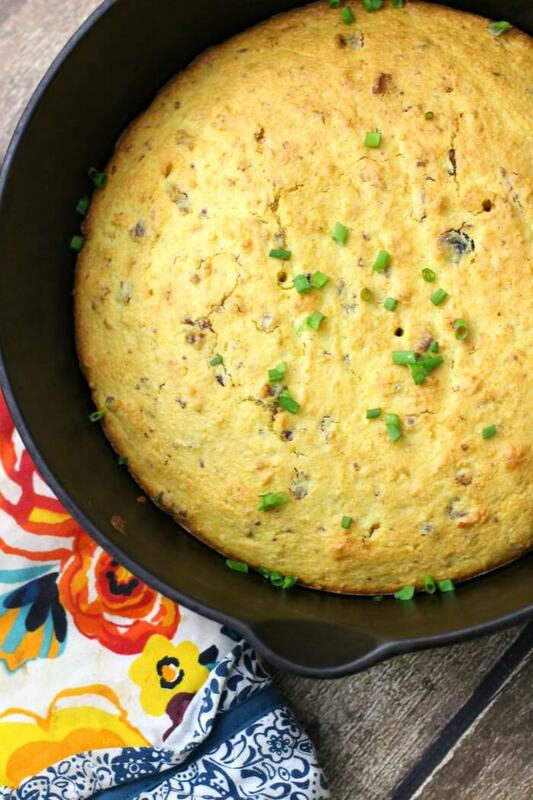 Tis’ the season for this Cornbread Recipe! The kids are back in here in Florida, so of course everyone’s all CHILI! CORNBREAD! FIRE PIT! SWEATERS! BOOTS! And, I am no exception. I will cop to being super basic and loving it. Heck, just look at the number of pumpkin recipes on this site! Hah! Definitely serve with our chili recipe (no beans), and cinnamon roll cookies! It’s also great with mac and cheese! And why are we talking about corn again? 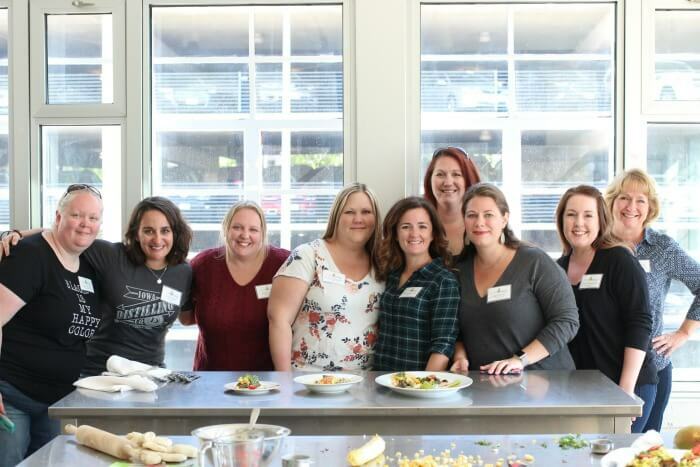 Well first because we love corn and it’s delicious, but *also* because I recently visited Iowa with Iowa Corn – we learned all about corn and soybean and Oh, and even got to ride in a pace car! 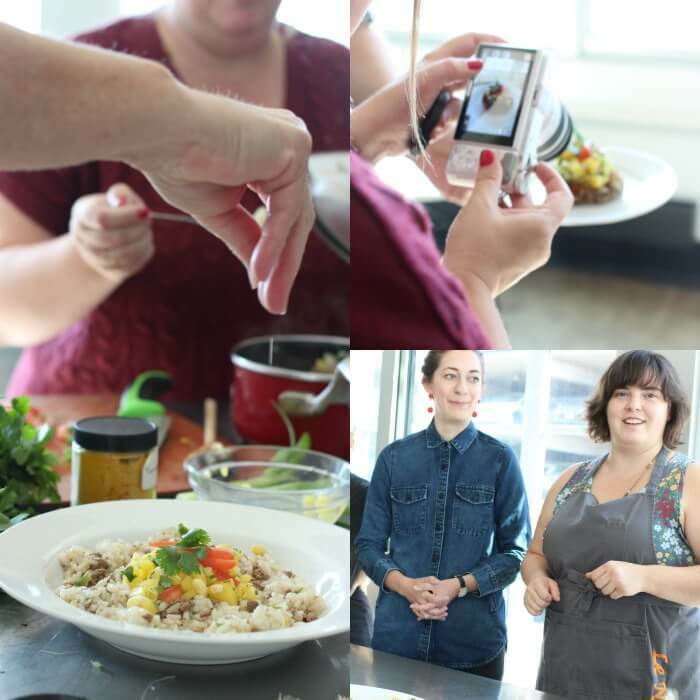 You can see the first part of our adventure along with a corn and tomato salad recipe here! Thank you so much Iowa Corn for hosting me on this trip! I already have a trusty sweet cornbread, but I really wanted to make something that was a little more savory (enter, bacon), and dense (mmmm, corn kernels and heavy cream). I feel safe saying we nailed it with this cornbread recipe. 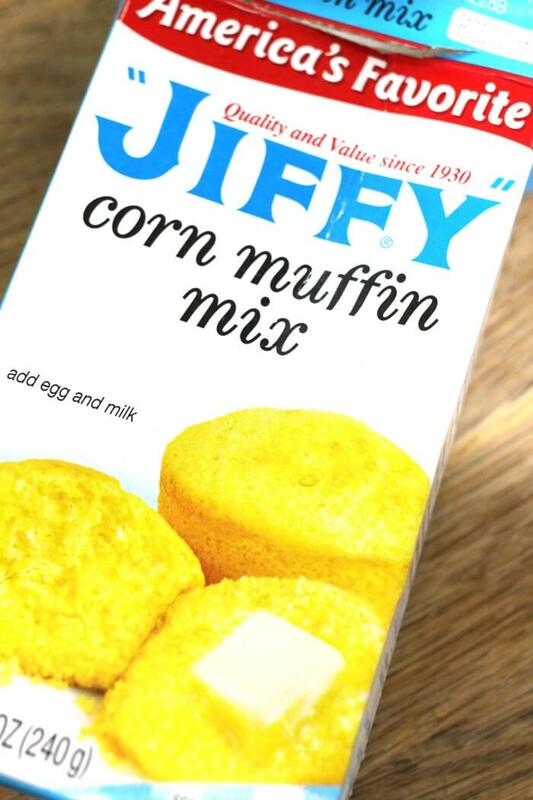 Corn muffin mix – We love the Jiffy corn bread mix to start with. Just like we start with cake mixes and then make them better, why not make life easier! Corn kernels – If you have fresh sweet corn, that’s great, but in the absence of fresh corn, canned (drained), or frozen (thawed) will do just fine. Eggs – Eggs work as a binder to keep the cornbread from being too crumbly. Heavy cream – Heavy cream makes this cornbread moist and delicious. Bacon – Bacon adds a little bit of texture and a whole lot of salty goodness. In my opinion, you don’t want to skimp on this ingredient! 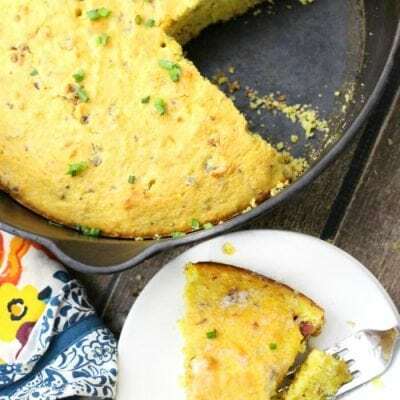 Heavy cream and sweet corn kernels in the batter add a delicious richness to our skillet cornbread recipe. Which, by the way, does not actually have to be made in a cast iron skillet if you don’t have one! It does make for nice browned edges and a beautiful presentation though! You can usually find a good size cast iron skillet in the $10 – $20 dollar range at most big box stores. I love me some William Sonoma (oh, boy do I ever), but when it comes down to it, inexpensive cast iron is always preferable to no cast iron! Has there ever been a time when bacon didn’t make something better? If there is, I don’t want to hear about it. 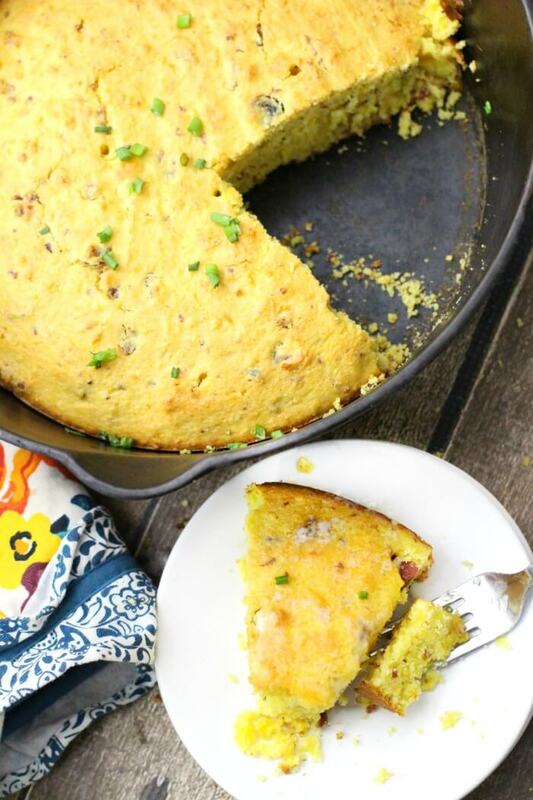 This cornbread with bacon is definitely better WITH the bacon. Mmmmmm. You can toss in as much as a cup of crumbled bacon, depending on how strong you want the flavor. The batter will be super thick and chunky. This is exactly right! Don’t worry about making it smooth. Add some chopped pickled jalapenos for a cornbread recipe with a kick! Skip the bacon if you want to make it vegetarian. Scoop in a few tablespoons of white or brown sugar if you want to sweeten things up. 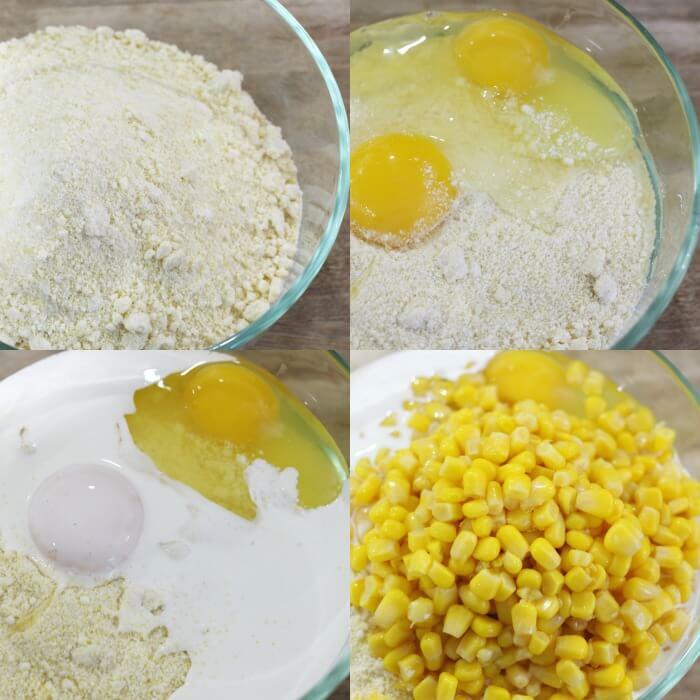 Use creamed corn instead of whole kernels to make an even moister cornbread. The best cornbread has a balance of sweet (from the corn) and salty (from the bacon). It’s moist (from the cream), and not too crumbly (thanks to the eggs!). 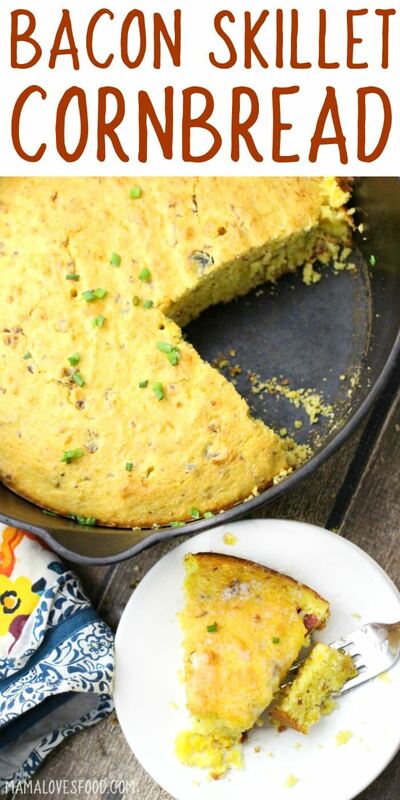 The best cornbread recipe also tastes like corn! And we do that by adding whole corn kernels along with our corn meal mix. Cornbread is not a healthy food perse, but we believe everything is healthy in moderation. Serve it up with a hearty bowl of protein filled turkey chili and some roasted okra. Now it’s healthy! There is no added sugar in this cornbread recipe, but many folks do add sugar to their cornbread. You can add a few tablespoons of white or brown sugar to this recipe if you like, or check out our sweet cornbread recipe. Depending on where you visit in North America, people have very strong opinions about whether you should add sugar to cornbread! Make this with our cornbread recipe! Combine muffin mix, corn kernels, eggs, and whipping cream in a bowl and blend with a stick blender (or use your upright blender) until ingredients are mixed, but still lumpy. 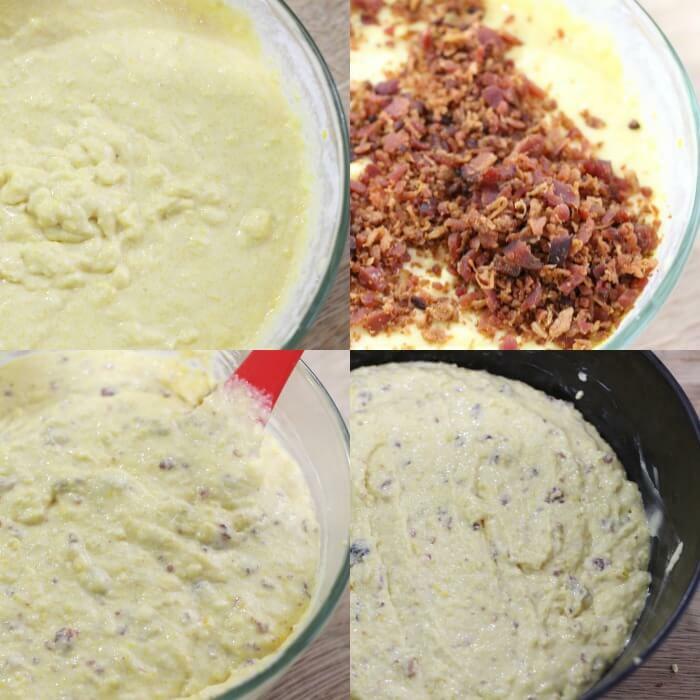 Stir in crumbled bacon, and pour batter into a greased cast iron skillet. Bake at 400 degrees for approximately 25 minutes until a toothpick comes out clean and the corn bread is getting toasty and browned. If you want a little extra browning, turn on the broiler for the last two minutes. But watch closely! Serve warm with salted butter, or room temperature, or cold, or any way you like because it's delicious! Wow that looks like you had a great time!! Here in the south we love our cornbread. I’ve marked your recipe to try next! 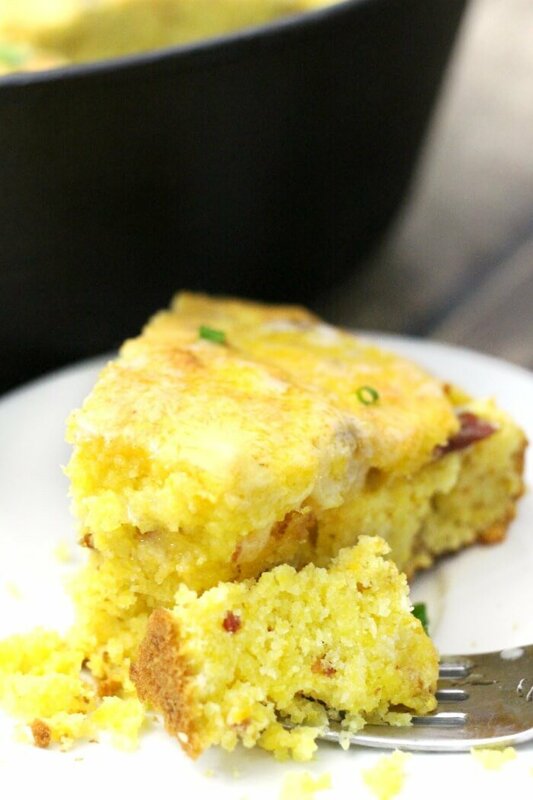 Why had I never put bacon in my cornbread before? Pure delicious genius!!! That cornbread looks AMAZING!!! I’m like you…I LOVE me some bacon!! 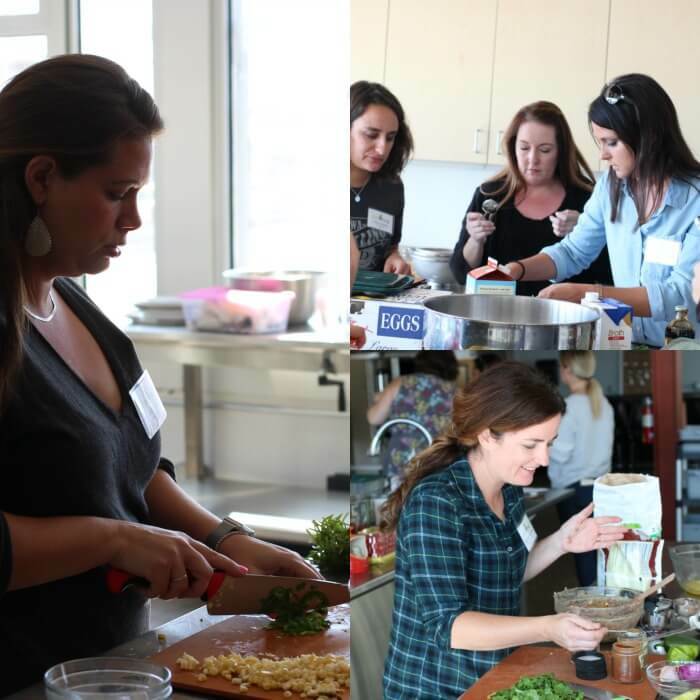 Have anymore recipes that incorporate it? Cannot wait to try it! Thanks for sharing! !